The Marijke-Headwaters Society is comprised of a small but growing group of forward-thinking donors who have chosen a legacy gift to help ensure that our children and grandchildren will be able to enjoy the beauty and bounty of clean streams. After the passing of Marijke Wijsmuller in 2004, the Delaware Riverkeeper Network formed The Marijke Wijsmuller Society to honor the individual efforts of this long-time supporter of, and volunteer with, the Delaware Riverkeeper Network. Marijke Wijsmuller worked to make the world a healthier, more beautiful place with native plants. She inspired many to follow her example of care and protection for the environment including her daughter, the Delaware Riverkeeper, Maya van Rossum. 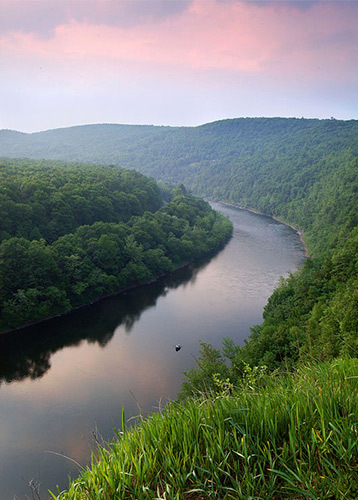 Today, the Marijke-Headwaters Society also honors those whose legacy gifts will benefit the entire Delaware River system for generations to come, similar to the way our headwaters streams play an essential role in the health of all downstream waters. A “Remember the River” lapel pin. Recognition in publications like River Rapids, our postcard newsletter, or in our annual report (unless donors choose to remain anonymous). Invitations to special events, trips and paddles just for members of The Marijke-Headwaters Society. Other special benefits that are tailored to fit the gift. The greatest benefit members of the Marijke-Headwaters Society receive is the knowledge that they are helping to ensure a strong river advocacy organization working throughout the 13,539 square miles of the Delaware River Watershed. Bequests: Make a gift to support the River in your will or living trust. Retirement Plan Assets: Use your tax-deferred retirement plan assets to benefit the River. Life Income Gifts: Transfer assets to the Delaware Riverkeeper Network and you and your chosen beneficiary receive income for a term of years or for life. After the conclusion of the term, the remainder of the life income gift is distributed to the DRN.